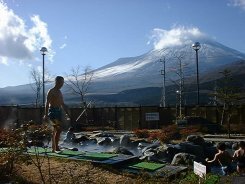 Tenkei is a big hot spring near the Subashiri mountain-climbing start point of Mt. Fuji. Since it was crowded in summer, we came in the midwinter when Mt. Fuji is beautiful. The first floor has a swimming suit mixed- bathing zone and a hot spring zone by man and woman. The second floor has a reception desk and a rest room, and the third floor has a rest room and a dining-room. Open-air baths are in each of a swimming suit zone and a hot spring zone. The long bath like a child's pool, a hinoki bath, a cascade bath, a medicinal bath, a Jacuzzi, and a herb mist sauna are situated in the swimming suit zone. The open-air bath of four size is situated in the outdoors. An open-air bath, a main bath, and a sauna are situated in the hot spring zone. A salt sauna is situated in the bathroom for ladies. Mt. Fuji is visible to the front of an open-air bath clearly. Since the wall by the side of Mt. Fuji of a bathroom is glass, it is very good scenery. There are a tepid open-air bath and a hot open-air bath. In the midwinter, a hot bath is good. Looking at grand Mt. Fuji and being soaked in an open-air bath has a very good feeling. Many young couples are also coming. The herb mist sauna was also interesting. You will be wrapped by the warm fog in which there is the scent of a mint. It is good to meditation. Kumako used the salt sauna and she said. "I tried to massage my body with salt. My waist did not become thin. However, my skin became smooth." A rest room is large. Although a charge is a little expensive, its you are good for enjoying yourself half a day. If you do not bring a swimming suit, you will repent. Since there is no rental swimming suit for males, be careful. The open-air bath of the hot spring zone. Get down by Gotenba IC of a Tomei expressway, and go the national highway of No. 138 north. Pass through under Subashiri IC and go in the direction of Yamanaka lake. 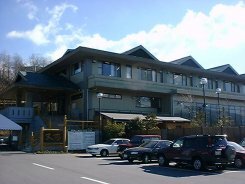 It is in the other-side side to the clubhouse of a golf course.